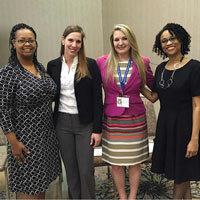 A group of students and faculty from the Department of Professional Counseling in the College of Arts & Sciences presented at the South Carolina Counseling Association conference in Hilton Head, South Carolina, the weekend of Feb. 25-27. Students Arna Erega and Audrey Truesdale, along with Webster Columbia, South Carolina, faculty member Alexanderia Smith and visiting professor Rebecca George, presented A Recipe for Preparing Self-Care to Avoid Burning Out. George also presented High Stakes: Learning Ethics via Mock Hearing Board Trial Simulation with student Karrie Allen.